If you're ready to move up to high-definition TV, the 32-inch Olevia 532H HDTV is the ideal choice for home or office — packed with the industry's top technology and innovative Olevia-first features. Featuring best-in-class video and audio, it is powered by ATI's state-of-the-art Xilleon™ video processor technology, and features a combo ATSC/NTSC tuner, super-wide 178-degree viewing angle, 1600:1 Dynamic Contrast Ratio, and fast response time. This means the Olevia 532H displays everything — high-definition digital TV and widescreen movies (up to 1080i resolution), standard analog TV, action sports, video games, and home videos — with stunningly crisp, rich and vibrant imagery. 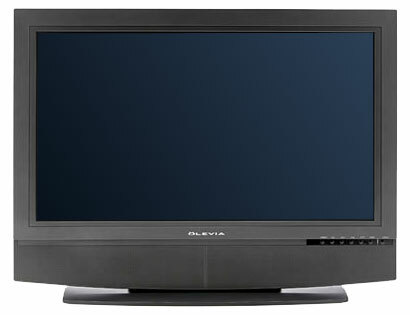 This 32-inch HDTV can even double as a computer display with support for resolutions up to 1360 x 768 through HDMI and VGA. The 532H's horizontal (or bottom) mounted speakers complement its surround sound audio processor, making digital (SPDIF) theater-quality audio part of this outstanding new entertainment experience — all thanks to Olevia. Dimensions w/ Stand 31.9" x 24.6" x 9.4"
Weight w/ Stand 38.80 lbs. The 532H is one of the Olevia 5 Series LCD HDTVs designed expressly to deliver outstanding quality and comprehensive features. Vibrant image quality, powerful digital tuner technology and built-in RS-232 control, for connection with a home entertainment system, make the Olevia 5 Series ideal for virtually any content and any environment — now and in the future. Calibrated 6500K color and a full range of brightness, contrast, color, tint, sharpness and mode controls available to tune image quality. Advanced technology displays up to 37% more of analog images and 11% more of digital broadcast images, without distortion. Scrolling icon wheel simplifies use and features preset video and lighting modes for different environments and content types. The latest software updates and quality improvements available from the Olevia website, easily uploadable to your TV through its USB port. Live, in-house technical and customer support personnel assure a total quality experience — every time.